DETAIL Data scrutinised three and a half years of financial assistance Invest NI offered to Northern Ireland businesses between April 2011 and September 2014. In total 6,653 projects across Northern Ireland received £323million from the economic agency with indigenous firms in the former Belfast City Council area securing 40% of the overall funding. In addition to the main findings which can be read here, Detail Data can also today publish a breakdown of the support given to companies across Belfast. The further analysis of the Belfast figures by parliamentary constituency shows that the overwhelming majority of the Invest NI financial support went to South Belfast. 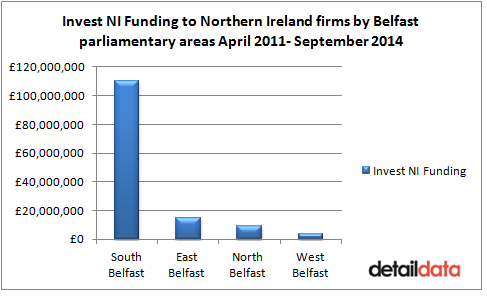 It received £110million (79.9%) of the total £137.8million funding Invest NI provided to local businesses in Belfast. Based within South Belfast are Queen's University and NI Screen which were two of the largest recipients of Invest NI funding during the period under scrutiny. Local firms in East Belfast secured £14.9million (10.8%) of Invest NI funding, North Belfast received £9million (6.5%) and West Belfast benefited from just £3.8million (2.8%). The new figures produced by Detail Data's open data analyst Bob Harper also provided a breakdown of jobs across the city. In terms of the number of jobs ‘promoted’ – new jobs a company intends to create as a result of the project – South Belfast was considerably higher than the other three parliamentary constituencies. Companies in South Belfast planned to create 1,319 jobs compared to 539 in East Belfast, 395 in North Belfast and 206 in West Belfast over the three and a half year period. To view the main analysis and report by Detail Data on Invest NI’s work click here. * Detail Data is a joint project between investigative news website The Detail in Belfast and the Northern Ireland Council for Voluntary Action.